Let us distract you from the on-going politics and focus instead on Eastbourne’s endless blue skies, sweeping South Downs countryside and colouful arts scene. Last year we provided more happy holiday rentals than ever before, and we are here with our finest selection of hand-picked properties for your perfect 2019 getaway. We’re already seeing a huge influx of enquiries, so how about investing in some ‘you’ time with a South Coast break…. 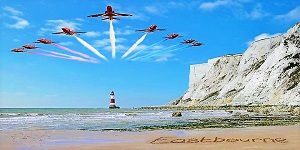 Here at Exclusively Eastbourne, we always offer the finest holiday properties around Eastbourne and East Sussex so check out these fabulous places. For more information on our new properties, follow the links below or give us a call on +44 (0)1323 40 60 90. Grade II-listed 2-bed country cottage originally built in the 1750s, so full of character and with an idyllic setting, making this ideal for invigorating walks, cycling holidays and pub lunches. Step out of the house and onto paths leading immediately to the South Downs National Park or hunker down by the fire or pootle along to the either of the two fine pubs in the village for local ales and hearty food. Short stays also possible last minute and out of season. Beachfront home in Pevensey Bay with sensational views and a tranquil garden leading onto a private beach. Ideal for families, with three bedrooms to sleep up to six people. Wake up to the sound of the waves and gaze out across the sea to the horizon to feed the soul! Immaculate contemporary apartment with breathtaking views and balcony directly over the beach in Sovereign Harbour, with three bedrooms to sleep up to six in style. Enjoy sea views from the lounge, dining area and all three bedrooms. Wow! East access thanks to a lift and with two private car park spaces. Cosy cottage right on the beach in sought-after Pevensey Bay with flexible accommodation for up to six people. With two double bedrooms and a bunk room for the children. You can also choose a two-bed set up for up to four people at a lower cost. Dogs are considered as well so no need to leave your four-legged friend behind – with a private beach to enjoy you’ll want to make the most of it! Charming three-bed cottage in the heart of Meads Village, perfect for walks along the Seven Sisters cliffs and along the Eastbourne promenade (if you can prise yourself out of the cafes and pubs on Meads High Street). Full of Victorian charm and ideal for families or friends looking for an escape from the city. 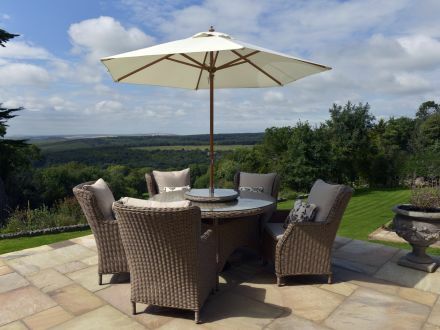 A pretty private rear garden with table and chairs. Comes with a handy parking space (a rare treat in Meads). Immaculately refurbished throughout for a pristine finish, with three large bedrooms to sleep up to six people so very family friendly. The holiday apartment is in the very heart of central Eastbourne so recommended restaurants are moments from your door. Small dogs are also considered at this holiday flat. Don’t wait to start your holiday planning for 2019: contact us now on info@exclusivelyeastbourne.co.uk, call us on+44 (0)1323 40 60 90 or give our Live Chat feature a go. We are a small, friendly team who all live in and around Eastbourne so are perfect if you need ideas on the best locations for your needs, and we all know our holiday homes inside out so just fire away with questions!